It’s September…How Are Your Ovaries? I’m reading a book about how making split-second decisions from the gut can be just as effective (and in some cases, more so) as examining copious evidence and making logical, scientific decisions over time. All symptoms of ovarian cancer. Classic symptoms, as a matter of fact. Like, textbook. But I was sure that there were logical explanations for all of the things that were going wrong with my body, including the pelvic pain, which I convinced myself was a functional cyst, since it hurt worse when I was ovulating. If I’d known more about what the symptoms of ovarian cancer were, if I’d known that HALF the women diagnosed with ovarian cancer are under age 60, I might not have convinced myself that I was too young and healthy to have anything really wrong with me. I might have gone to see my doctor in December, when I first noticed things feeling…different. Nothing I could really put my finger on, but my instincts recognized changes before my rational brain did. 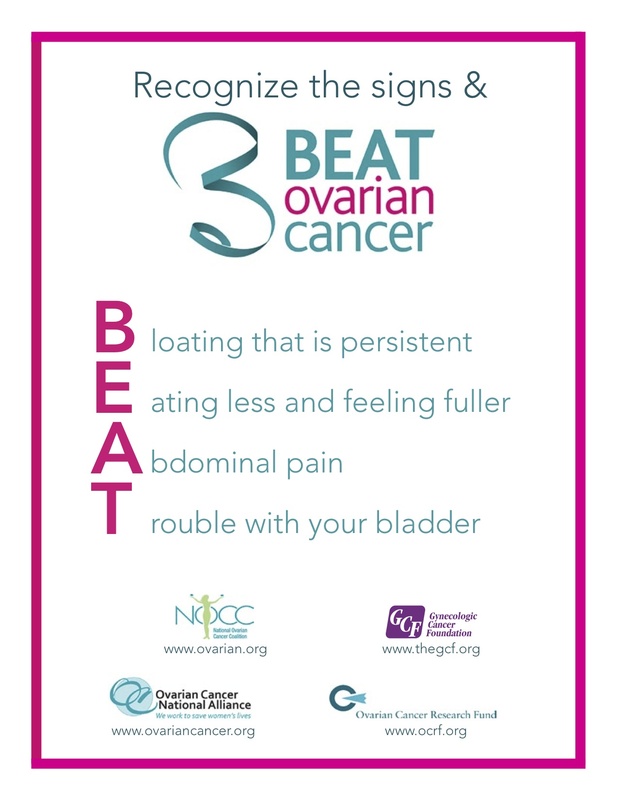 Over 21,000 women will be diagnosed with ovarian cancer in 2010. 13,000 will die from the disease. I’ll fight that second number, but I need your help with the first one. Let’s increase our vigilance about ovarian cancer, even as we lobby for research funding and to get more doctors to take our symptoms seriously. Let my 20/20 hindsight help you or a woman you love be aware of the symptoms of ovarian cancer, so you (or she) will get checked out by a gynecologist as soon as you experience them, and get treated early enough to get on the 85% five-year survival side of the statistics, instead of the 35% side where I am. I know I make ovarian cancer look good, but this is one club you do NOT want to join. Tell a friend. Or thirty. I’m so glad you’re bringing this to everyone’s attention. I am a recurrent, constant, haven’t hit remission yet ovarian cancer fighter. I like you blog and linked your latest post to my facebook page. Thanks for posting it, you sound like my kind of gal! Thanks, Maggie! I’m sorry to have to meet you like this, but so glad you’re with me in sharing the list of symptoms with as many people as we can. I have a feeling that I’m gonna get kind of obnoxious by the end of September, but if it saves one woman from getting into this sh!tstorm, so be it.